We recommend reviewing the article “How do I create an SPF record?” and following tools such as Unlock the Inbox™ SPF Wizard or Unlock the Inbox™ Sender ID Wizard to create a proper SPF record. Once created, this article can be used to validate your records' existence and syntax. 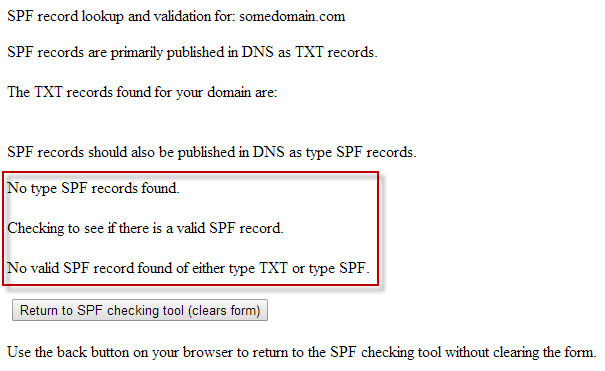 Step 1: Verify the existence of your domains SPF record in DNS. If you have completed this already, skip this step. Step 2: Use the tools at Kitterman.com to validate your SPF records. Use the “Does my domain already have an SFP record? What is it? Is it valid?” test. Your domain name will be processed and a report will be created. If your domain an SPF record is found and syntactically valid, the report will indicate box. Use the “Is this SPF record valid – syntactically correct?” test. Enter your domain in the dialog box (e.g. 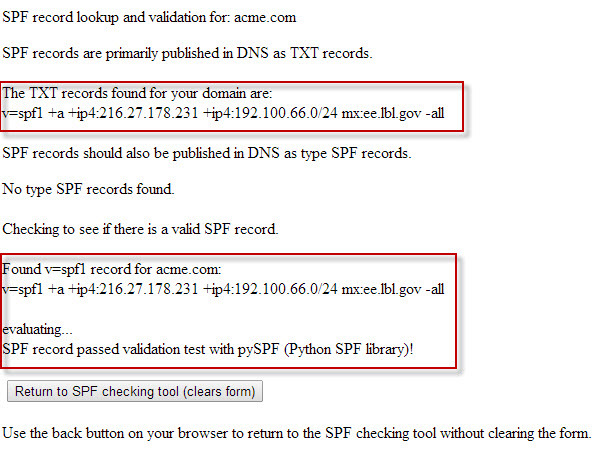 acme.com / no ‘www’ or ‘mail’ prefix) along with your TXT SPF record from DNS and click “Check SPF record” button. Use the “Test an SPF record” test to evaluate the performance of your SPF record based on the IP addresses you’ve indicated should be valid for sending email (e.g. all servers that might send email on your domains behalf). Enter your mail servers IP address (verify here), your SPF record and any email address under that account, then click the “Test SPF Record” button. Note: If testing for MailChannels relay (users of our shared hosting email servers – verify here), make sure your SPF record has been updated as per the KB Updating your SPF record to include Mailchannels support and has ‘include:relay.mailchannels.net’ as part of the record.